mum migrants of the world unite mum-mi-grant [mum- i - gruhnt] noun - a mummy who migrates to another country, usually for permanent residence An honest look at being a mum and a migrant. Fun Time Friday! 6 years ago Hey itâ€™s almost the weekend so letâ€™s share a bit of expat humour! 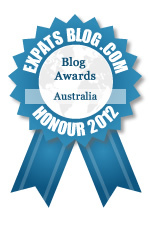 ExpatsBlog.com Expat Blog Awards 2012: Australia Honourable Mention Award! This blog won the Honourable Mention Award for best expat blog in Australia! This blog is fantastic! It shows the true picture of life in a new country with the challenges and delights of absorbing a new culture and adapting to it. The writers are eloquent and honest and I look forward to many more episodes in future. Funny and truthful, great little blog! Well done and keep it up! Great blog! I really admire the mummies for sharing their experiences and helping others. Keep it up! Great name for an insightful blog. Sure it is helpful to other mummigrants. Keep up the good work. Very funny and so true. As a second stint mumigrant it is good know there are like minded mums out there. Wonderful insight to the highs and lows of settling into a new culture and adapting to a different way of life. Love the titles and the honesty of each account. Keep up the good work!! Fantastic site!!! Very intersting and, at times, very funny posts. Althought my Australian dream did not work as we hoped, I LOVE reading these blogs and hearing how well other peoples dreams have materialised. Keep up the good work!! Fantastic blog. Can totally relate. A lighthearted fun look at life in a different country. Excellent, keep up the good work.